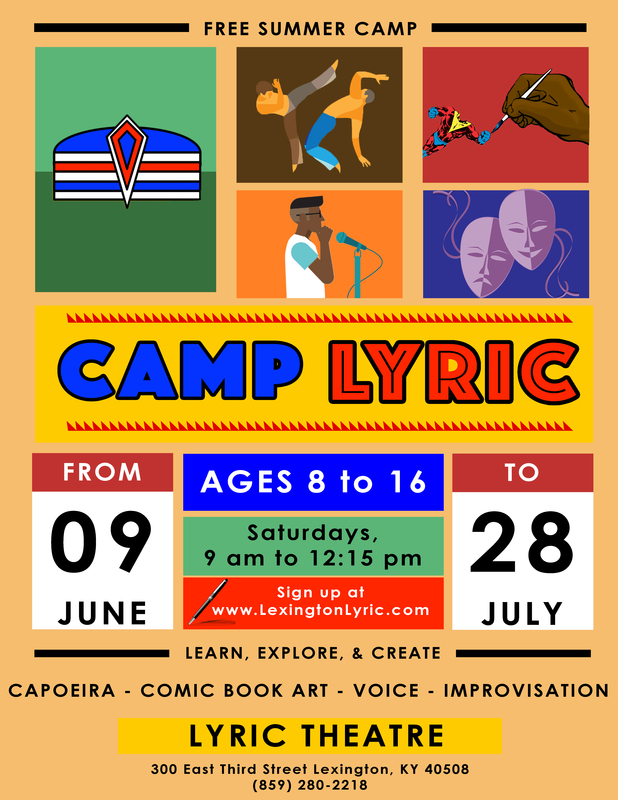 Our next installment of 'Camp Lyric' is TBA, but check out our last one and check back soon for more info! For six years, The Lyric has been proud to present our free Lyric Summer Youth Programming, teaching students confidence through creative education. Through these years, we listen to student and parent suggestions, striving to continue to improve and embolden the program to provide all we can for our participants. For our seventh year, The Lyric is thrilled to announce Camp Lyric: 2018 Lyric Summer Youth Programming! For this year's program, students are given an opportunity to participate and learn multiple avenues of creative expression for Free. This year we are planning to use a university model for the classes. Everyone will participate in a morning movement class then will have the opportunity to choose between 2 of 3 elective courses.As in year's past, this program will meet Saturdays in June & July from 9:00 am - 12:15 pm with breakfast provided, and will be presented FREE to participants aged 8 - 16! Our morning movement dance class will help our Camp Lyric participants prepare their mind and bodies for the day through capoeira! Regina Harris will lead students through Capoeira movement. Students will also learn the history and culture behind Capoeira. Students will learn how to draw and create a Comic Book finding creative expression through visual arts. Students will be immersed in improvisational games and exercises, deepening their acting and communication skills, finding creative expression through their own words and ideas. Students in Voice will work with Kelsey Jones, a music teacher in Fayette County Public Schools, to develop singing techniques, music appreciation, and creative expression through their voices.